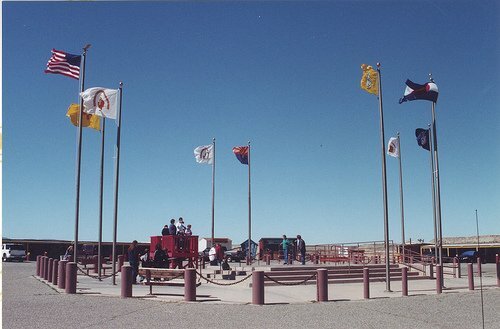 The Four Corners (where the states of Utah, Colorado, Arizona, and New Mexico meet), with state and tribal flags, and the American flag. March 30, 2001. Image: The Four Corners; uploaded to Flickr by user dbaron in July 2006 under a CC-Attribution license. This page was last modified on 10 March 2009, at 04:16.